Airport Assembly - Page 122. May 3, 2005: The last thing tonight was the relocation of the hose clamps on the heat shields of the LEFT exhaust pipe. I moved both screw clamps to the near side of the exhaust pipe to clear the lower cowl when it is put in place. The screw clamps were previously on the bottom side of the exhaust pipe. I also raised the pipe slightly at the rear by adjusting the little hose clamp you see at the far right of the picture on the smaller black hose. The lower cowl went back on with less problems this time. I think I have learned the correct sequence to get it on and off smoothly now. One more item to note, the Tugwell canopy opening cable is working just fine with no jamming today during opening or closing of the canopy. May 4, 2005: Wednesday was a milestone day if there ever was one to be had in the whole project, as you will see in the pictures below. The airport manager stopped by to visit for about 20 minutes or so. Frank Zarsky was the EAA chapter 150 President when I joined the local group a couple of years ago. He has been the airport manager for several more years. He commented on the airplane, and his experiences building his Rutan design. I had the left wing up on the work table and was checking things like how much of the wing spar will be showing when the bolt holes are lined up with the wing bulkheads in the fuselage. I took a piece of scrap fuel tubing and tried to predict the correct length of the tubing before I cut the one sticking out of the fuselage. I missed it by about 3/8" SHORT of course. Don't worry, there is enough extra tubing under the fuel valve that I can change my bends and get the extra length I need outside. The fuel vent line was fine since it had an expansion loop inside the fuselage. I finally settled on the routing of the pitot tube through the inside rib, and cut it to the desired length and shaped it to avoid the aileron push rod when it gets installed. I will not hang the ailerons or the flaps until I get both wings installed in the fuselage. Next came the marking of the fuselage side lines on the wing spar to tell me when I have it pushed into the fuselage for the main bolt hole alignment. Those four holes are 7/16" precision holes that were drilled on a jig at the factory to mate perfectly with the wing spar bulkheads in the fuselage. Notice that line on the scrap tubing? It is 3/8" too close to the fuselage and should be closer to the tank. It is a long story, I will cut it longer when I put in the RIGHT wing. 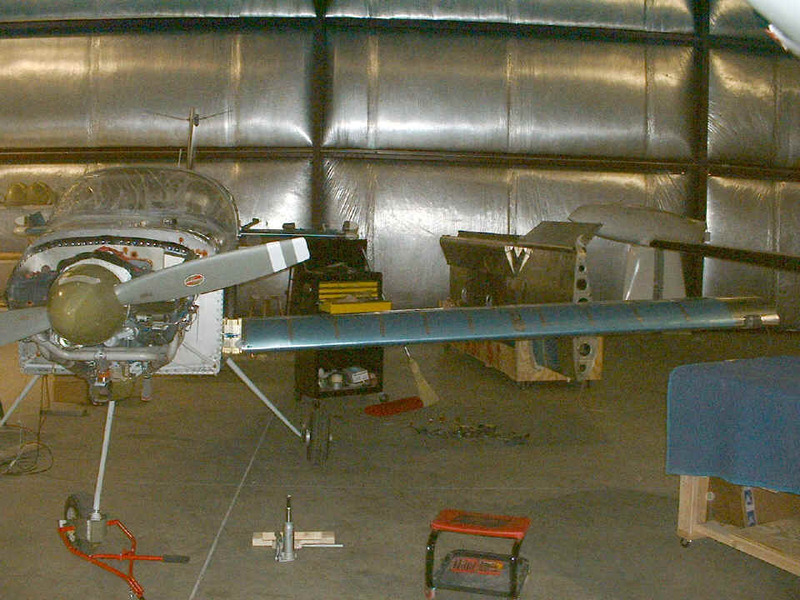 This was when I first put the wing in the fuselage without any bolts holding it, just the table and the fuselage opening for the wing spars. Notice the hydraulic jack on the floor, and the saw horse under the fuselage holding the LEFT main wheel off the floor. We had this discussion before, but for those tuning in late, it relieves the pressure on the wing bolts and the gear leg weldment that is bolted to the front wing spar bulkhead. That allows the close-tolerance wing bolts to fit through the wing spars and the bulkheads with miminal effort (stress on my part). This photo was taken before the sun went down. It does not show up well in the photo above, but before I worked on the wing installation, I finished grinding off the excess fiberglass and resin from the fiberglass cap to the vertical stabilizer and secured it to the VS with six screws. I also finished up the mounting of the tail light fixture after drilling a new screw hole and tapping it with my 4-40 tap. Inside is where all the action is on this part of the project. I had help from two of the local pilots to get the third and fourth bolts in position. I used the cheap bolts from Ace Hardware to get things going. I would move the wing very slightly up an down using the roll-around work table. That allowed me to get the undersized bolts into the wing, one in the top row, and one in the bottom row. Then I put in one precision bolt beside each of the two Ace undersized bolts. After that, I needed the help of the other two guys to get the last two bolts started as you see them below. Here is the result of the day's work, "a wing and a prayer". This photo was taken late at night and I had to process it in Corel Photo Paint to get it to look this way. It was underexposed, and it shows in the noisy textures. Yes, I remembered to connect the pitot tube and the light wires at the wing root when I was putting it all together. The weight of the LEFT wing without the flap and aileron installed on it is around 60 pounds. The airplane is sitting a bit off level on the landing gear, but it is in no danger of tipping over on the LEFT side. Notice that I brought the bottom half of my tool cart to the airport today. Now I can save some steps when I need a tool. It was 10:30 PM when I closed the hangar doors and headed for home. I got home in time to see the 11 o'clock news, get a sandwich, some grapes, and a Mint Sundae ice cream cone before coming up to post these photos. I may not go to the airport tomorrow. That will depend on how I feel from doing all that kneeling down inside the cabin to secure the wing bolts. I had to get out one time to "unkink" my knees, if you know what I mean? It is now after midnight and I am heading off to bed! Add 6.6 hours to the log book today, for a constuction total of 1879.7 hours. May 5, 2005: (aka 5/05/05) I could not let that pass, sorry. I got to the airport late today after doing some grocery shopping and answering a phone call from a friend in the Denver area about job possibilities, etc. I learned from my mistakes from yesterday. The RIGHT wing went on with the ACE Hardware temporary bolts to allow me to get some measurements of the fuel line, then cut it a second time to the correct length. You heard me, I cut it twice before getting down to the correct length. The marks on the front of the wing spar at the top and bottom representing the side of the fuselage helped again in getting it right the first time (before putting in all the wing bolts) and not fooling myself into doing something rash again. If you look at the extreme left side of the picture above, you will see the plexiglass lens of the landing light. There is a piece of tape on it which served as a handle when I was putting that lens in the wing cut out for the light. I finally took that piece of tape off each of the lenses and cleaned them to remove the remaining adhesive. You may also see the "mechanic's creeper" peeking out from behind the LEFT end of the covered work table. I used that tonight to scoot under the wing and drill some screw holes in the fuselage bottom pan where it overlaps the nutplates in the wing root rib. I deburred and dimpled those holes after I pulled the wing off to work on it up on the table as you shall see. After I pulled the wing back out of the fuselage, I installed the two plastic tubing air lines for the stall warning device. This is the eighth picture on this page and that means it is time to move to page 123. You can see more of how I did that on page 123. CLICK HERE for Airport Assembly - Page 123. RETURN to MAIN MENU.